Having five siblings, it’s easy to say that the temperature at home was always… well, competitive. And since I’m mostly competitive about things that my siblings don’t care about, I was not usually the one competing. To make myself feel better, I created little battles in my head that allowed me to come out champion. For one, on road trips in the suburban my sisters and I would sit in the first back seat, while the boys would sit in the second back seat. Now, I always let my sister, Lauren, take the seat behind my stepmom, and I would take the seat behind my dad. The trick here is that my dad is six feet and nine inches, so his seat pushes back all the way. Lauren would think she won, when in reality I loved curling up in the no-leg-room backseat. That way, later I could get her to let me win at something else because she felt like she had already won the leg room battle. Backwards? Probably. Victory for me? Definitely. Another example includes girl scout cookies. You see, I like all girl scout cookies. But I love the shortbread ones. Which nobody else is particularly fond of. They’ll eat them as a last resort, but they prefer thin mints or the ones with peanut butter. So while everyone else was fighting for the frozen carmel ones, I got the shortbread box to myself. A small victory, I know, but an important one. Factory made cookies aside, I love actual shortbread. One of my mother’s greatest tricks, I believe, is that she makes these amazing recipes that don’t actually take that much work. It only took me twenty some years, but I’m on to her. I used to crave her shortbread, asking her to make it all the time, until I realized how easy it was and just started making it myself. Shortbread is so easy you probably won’t believe me. You’ll google it, check my recipe against others, and maybe conclude that I wouldn’t lie about something so serious. And the best part? There is a good chance you have all the ingredients already in your house. 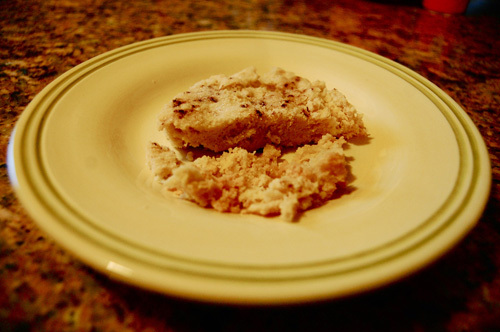 Traditionally a Scottish dish, shortbread is a staple in the south. Probably because the Southeastern U.S. was heavily settled by Scottish immigrants, and mostly because it’s good. Very, very good. The dish is comprised mostly of butter and flour, with golden and white sugar in smaller proportions. The name, shortbread, refers to the fact that it doesn’t rise. The dough is easy enough to shape if you want to make it into cookies, but I prefer to lightly press it into a baking pan. In Roy Blount, Jr.’s book Long Time Leaving: Dispatches from Up South, he has a short story called Mammy’s Little Baby Loves What, Exactly? in which he investigates what the famous lyrics “Mammy’s little baby loves short’nin’, short’nin’, mammy’s little baby loves short’nin’ bread.” According to Blount and John Egerton, short’nin’ bread is the same as Scottish shortbread. Which differs from what Wikipedia has to say, but I’ll take my advice from the author of Southern Food over an anonymous Wikiposter. 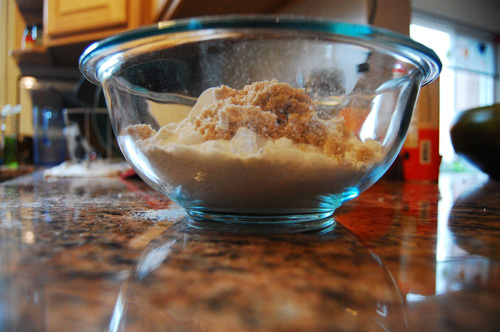 Using a whisk, mix together dry ingredients. I like using a whisk to incorporate dry ingredients for doughs and breads because it also incorporates air into your mix, making it lighter and fluffier in the long run. 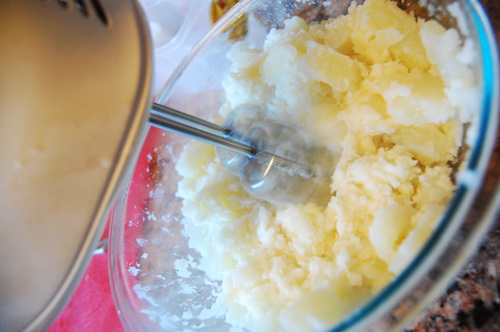 Cube your butter and, using your hands, add to dry ingredients. A lot of times when making a dough you’ll knead the butter with your fingers until the texture resembles cornmeal. That thickens it, and then you add a second thickening agent later, such as ice water or heavy cream. 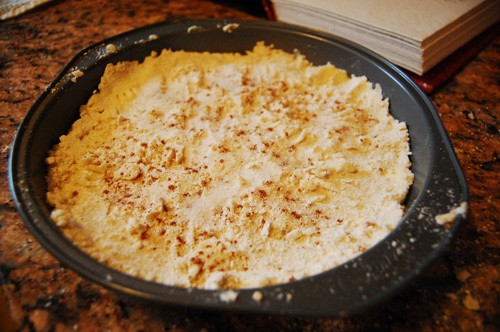 With shortbread, the butter is the be all end all, so you want to knead until the butter is incorporated and flattened, but it doesn’t need to be totally chunk-less. 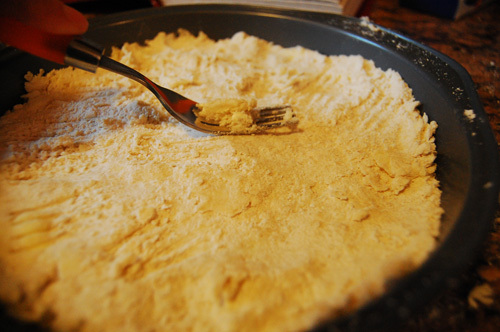 Dump your dough into a baking pan (ungreased) and use your hands to flatten it. Use a fork to press it down, and then sprinkle with sugar and cinnamon. After it’s baked, sprinkle again with sugar, let cool, and serve. After the divorce, my parents worked really hard to keep our lives as normal as possible. My mom, for instance, still makes a completely homemade dinner every night that one of us is home. However, one day in the late 90’s, she took some bad advice from a friend and tried to pass boxed mashed potatoes off as real mashed potatoes. Now, before you write me off as a potato elitist, hear me out. My parents, each of them, make fantastic mashed potatoes. They’re creamy, fluffy, and melt in your mouth delicious. The reason that Thanksgiving is my favorite holiday is completely wrapped up in that one dish… mmmmm mmmm potatoey goodness. Boxed mashed potatoes are okay. In a bind, I can see where they are useful. But after years and years of for no reason weeknight scratch mashed potatoes, those boxed potatoes didn’t get one bite past my brothers and I. And, in good fun, we haven’t let my mother live it down yet. That and the time she tried to pass ostrich burgers off as turkey burgers… we know better. 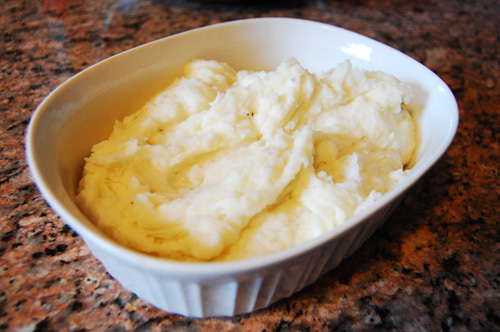 Mashed potatoes can be made with cream, sour cream, milk, butter, eggs, cheese, etc. Really, the creamy mixer of your choice. Personally, I was brought up mixing mayonnaise and butter into my potatoes. Now, if you recoiled at the word mayonnaise, well, you’re definitely not southern. My father, before his doctor started in on him about his cholesterol and high blood pressure, would eat mayonnaise with a spoon. It’s an integral ingredient in so many dishes, from tomato sandwiches to cole slaw. 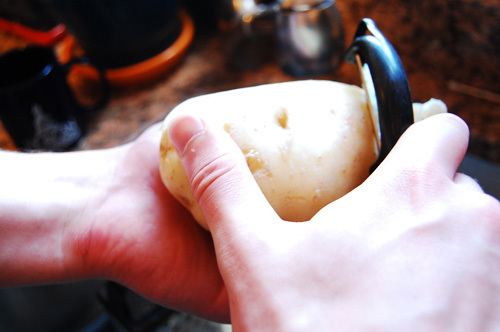 Peel, rinse, and slice your potatoes into large chunks. Submerge potato slices into water, and bring to a boil. Reduce heat to low, and simmer for fifteen minutes, or until chunks are soft. 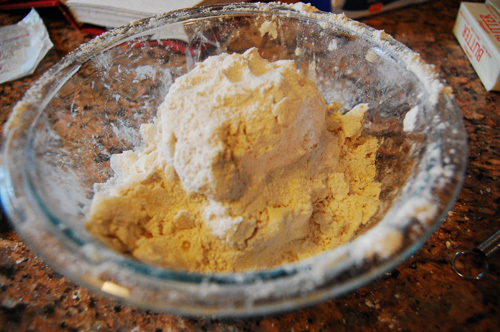 Strain, and dump into a large mixing bowl. 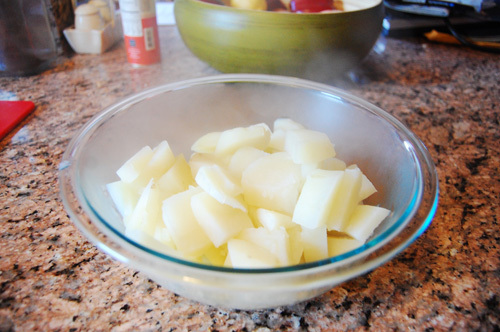 Slice a half stick of butter into 1/4 inch chunks and mix into the potatoes, stirring with a wooden spoon. Once the butter is melted, it’s time to bring in the mixer. Mix until the potatoes are semi-smooth, with medium size chunks. Now it’s time to mix in the mayo. 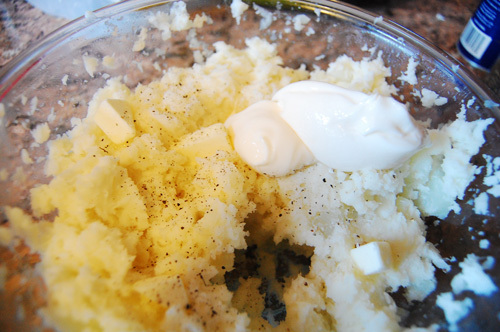 Now, I can’t tell you how to flavor your potatoes, so I recommend mixing the mayonnaise in a quarter cup at a time. This is also the time to mix in the rest of the butter and salt and pepper. Turn the mixer back on and blend until totally smooth. After this, all of your mixing/incorporating should be done with the wooden smooth, so your potatoes don’t get too gummy. Add mayonnaise and seasoning to taste, and serve. When he was in high school, my brother Reid had a band called Sweet Tea and the Carolina Soul. The name of the band is so fitting, you see, because the two are so intertwined. As a southerner, few things are more important or more staple in our lives than sweet tea. You may think I’m exaggerating, but I’m not. It breaks my heart every time I go to a restaurant in the north and see “iced tea” on the menu. Sweet tea is traditionally made with black tea, and is sweetened during or right after the water has boiled. I recommend Luizanne brand tea bags, but any other will do. If you’re looking to flavor your sweet tea, it works nicely to add a flavored bag along with the the regular black tea bags. It’s important to steep the tea while it’s boiling, not only does it cut time a little, it makes sure the tea is nice and strong. Personally I prefer my sweet tea with lemon. Some people don’t, but I find that it cuts the sugar taste nicely so you don’t feel overwhelmed. 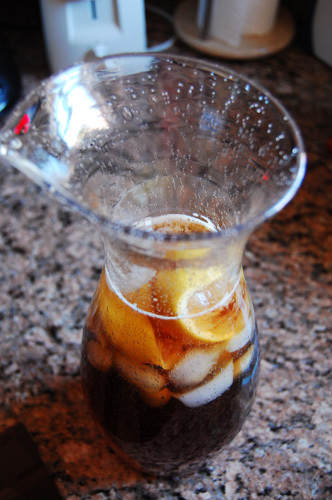 Sweet tea is made with ice, which helps cool and dilute it. 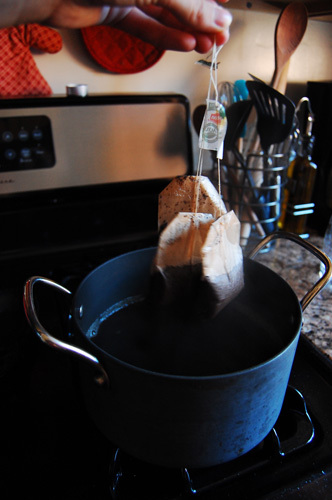 I make an amount of tea to fit the pitcher I’m using, so I fill my pitcher up 3/4 of the way with water to boil. Then, when it comes time to measure out the ice, I fill my pitcher a little less than half full with ice. I go ahead and add the lemon to the ice, so that the hot tea has to pour through the lemon skin, enhancing the flavor. 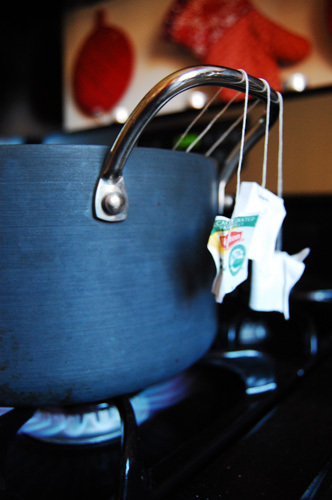 Bring water to boil, with tea bags steeping (Be careful how you hang the tea bag strings, I’ve had experiences where the paper tag got too close to the burner (gas or electric) and caught on fire). 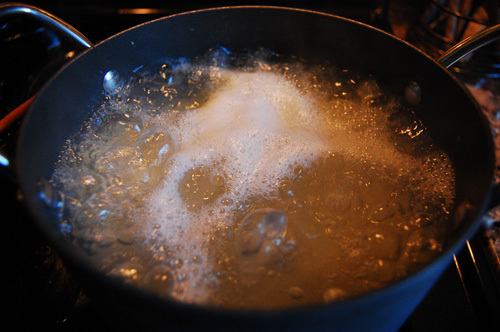 Once the water has boiled, turn off the heat and let steep for five minutes. Fill your pitcher a little less than halfway through with ice. 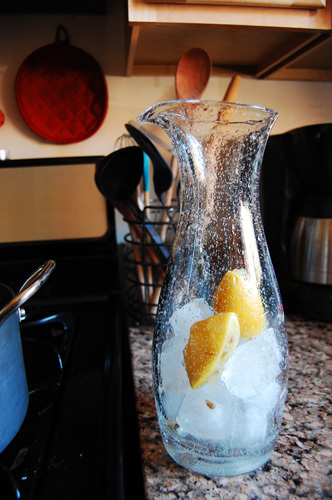 Squeeze lemon juice onto ice, and leave the lemon in the pitcher. Slowly stir sugar into hot tea, until fully dissolved. Pour tea over ice, and refrigerate. Serve cool, with more ice and a wedge of lemon.